Travel west from Baltimore and Washington, D.C. to the Allegheny Mountains, extending 400 miles across four states. Enjoy fall foliage as you ride some of the historic trains built for lumbering, coal, and passengers, which altered the region's history. Save $150 *per person when you book by May 10, 2019! The Allegheny Mountains, which extend 400 miles across four states, once impeded trade and settlement until railroads changed the landscape. Join us in the autumn to experience some of the important railways, built for lumbering, coal, and passengers, which altered the region’s history. Baltimore & Ohio Railroad: The B&O began the nation’s first scheduled passenger trains in 1830. Trace its history at Baltimore’s B&O Railroad Museum, a Smithsonian Affiliate, and tour some of the city’s historic railroad stations. Cass Scenic Railroad: The Cass Railroad required special trains and switchbacks for logging this mountainous region. See a large concentration of Shay gear-driven steam locomotives and ride one of the historic trains to the top of Bald Knob, third highest peak in West Virginia. From here, enjoy panoramic views of the fall foliage. In the Greenbrier River Valley, ride a train powered by a rare Climax locomotive built in 1910. Chesapeake & Ohio Canal National Historic Park: Ride on the Western Maryland Scenic Railroad starting from Cumberland. You’ll also see the recently restored Chesapeake & Ohio 2-6+6-2 no. 1309—the largest steam locomotive operating in the eastern U.S.
On May 22, 1830, a horse-drawn Baltimore & Ohio train traveling 13 miles to Ellicott City began the first regular railroad passenger service in America. The Baltimore & Ohio collected locomotives and other artifacts of its history and in 1953 opened the B&O Museum, where our tour begins. At Baltimore Penn Station we board Amtrak’s Cardinal for Clifton Forge, Virginia, by way of Washington and Charlottesville. 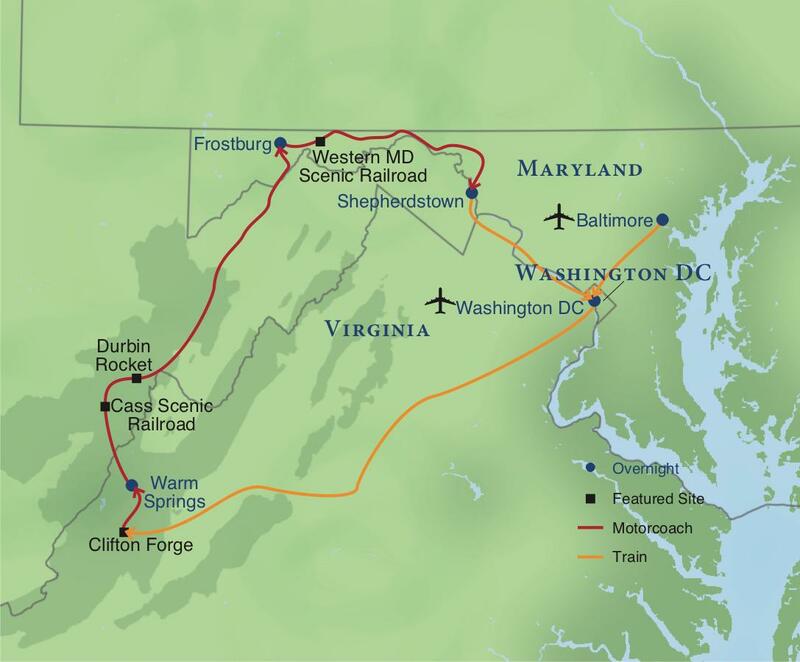 The train crosses the Potomac River, passes through Virginia's rolling horse country, and crosses the Blue Ridge Mountains and Shenandoah Valley before climbing the Alleghenies. This morning we travel beside the Greenbrier River on the “Rocket” powered by a rare Climax locomotive built in 1910 (train journey: 2 hours). This morning’s trip on the Western Maryland Scenic Railroad (train journey: 2 hours, 30 minutes) begins at an imposing office building and station in Cumberland, Maryland, built in 1913. The building, now the centerpiece of Canal Place State Park, also houses a visitor center for Chesapeake & Ohio Canal National Historical Park. WMSRR’s roster includes C&O 2-6+6-2 no. 1309, the largest steam locomotive operating in the eastern United States. Day 7 – Washington, D.C.
Day 8 – Depart Washington, D.C.